You're welcome to join my family for Thanksgiving dinner. Of course, we'd love to have you. No, you don't need to bring a thing. And I'm not just being polite. I'm perfectly serious. I don't want you to bring anything. Not your grandmother's Brussels sprout casserole. Not your mother-in-law's jalapeno chutney. Not even your famous caramel-rhubarb pie. Don't bring ANYTHING. You'll have to forgive me if this sounds a bit ungrateful. You know I wouldn't do anything in the world to hurt your feelings. I'm sure those recipes of yours are absolutely delicious, and I'd really love to try them sometime. But not at my Thanksgiving dinner. You see, in my family, we prepare one menu for Thanksgiving dinner, and one menu only. We do not change the menu. We do not "experiment" with new dishes for the menu. And we do not welcome outside contributions to the menu. It is the same as it was ten years ago, and thirty years ago and seventy years ago. Well, I take that back. For decades there was a mince meat pie. I don't even know who made it, but everyone always said that it was my great Uncle Guy's favorite. That must be true, because he was the only person who ever touched a piece of it. (Personally, I've always been suspicious of any dessert made from a hog's head, but that's just my opinion.) Anyway, about twenty years after Uncle Guy died, somebody finally wised up and quit making that mince meat pie. Nobody ever missed it. Aside from that one tiny item, though, nothing else in the entire menu has changed, despite onslaughts from the outside world. It hasn't always been easy. For example, when my sisters and I first got married, our new husbands actually had the audacity to suggest that we incorporate recipes from their mothers' Thanksgiving dinners. Can you imagine? We stood firm, however, stubbornly refusing to give an inch or even an olive, and the meal remained intact. Unfortunately, situations do arise where we're required to dine at someone else's home on Thanksgiving, and when that happens, we try our best to be gracious about it. Taking a small portion of (ugh!) stewed pumpkin pudding, we smile and say, "Now I see why my husband loves your cooking". Serving ourselves an even smaller portion of (yuck!) mashed yams with raisins, we remark, "I simply must get your recipe for these". And managing to avoid altogether the (gag!) oyster-walnut stuffing, we explain, "I don't seem to have left enough room on my plate. I'll have to catch it on the next go-around". But the truth is, what we long for are the comfortable, familiar tastes of our own Thanksgiving dinner. Of course, everyone has a weak moment now and then, and I'll admit that sometimes we ourselves are tempted to try something new. We see an elaborate recipe in the November issue of Southern Living for corn chowder, and wonder if we could possibly slip it in as a first course. Or we watch somebody deep-fat-frying a whole turkey on the Food Network, and consider serving one at our own Thanksgiving meal. But deep in our hearts we know that will never happen. Our sacred menu is not to be tampered with, even in the slightest. This is serious business, and we have a zero-tolerance for violators. The sister who tries to slip a little garlic into the mashed potatoes, is stripped of her hand-mixer and banished to putting pickles on the relish tray. To the mom who has the nerve to sprinkle a touch of Rosemary when seasoning the turkey, we cry, "Off with her head!" and relegate her to putting ice in the glasses for tea. And as for the culprit who dares to chop a boiled egg into the giblet gravy, she is forced to pick every spec of it back out again. Then we make her sit at the table with the children. As I said, this is serious business. Now I realize that I've probably stepped on some toes here. The very dishes at which I have so rudely turned up my nose are likely to be the ones treasured most by your family. And that's fine with me. I'm not saying that there's anything wrong with those dishes. In fact, I hope you'll go right ahead and serve them, and enjoy them. After all, as the saying goes, "Thanksgiving isn't about food. It's about being thankful". It's such a lovely sentiment. But whoever said it was probably a pretty lousy cook. 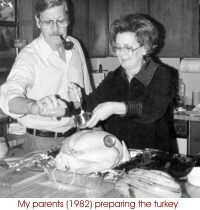 Search for Holidays articles similar to "Talking Turkey. Search all articles similar to "Talking Turkey".